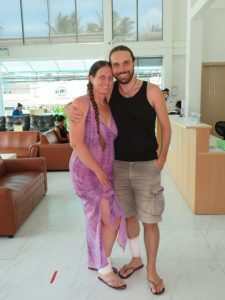 We had a shorter-than-usual stay on Koh Phangan this time, because we had a date to meet Erin and Tammie in Kuala Lumpur as the started their world travels together. However, despite the shortness of the visit, we managed another round of hospital. This time, it was Jenny’s (Jnani’s) turn in the hot seat. 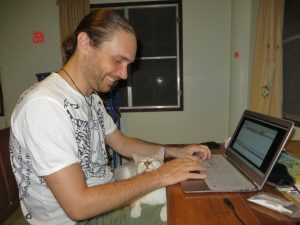 It all began with a teeny scratch (Jnani) and a mosquito bite (Ravi), which got infected (quite common on Koh Phangan). 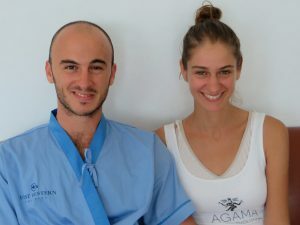 We went to the hospital when they hadn’t healed for a couple of weeks, and had the wounds cleaned and dressed properly. As commonly happens, we met friends there! (Ben had dengue fever). Ravi’s wound responded well to the cleaning, but Jnani’s had already progressed to cellulitis. It continued to spread despite the oral antibiotics, so she was admitted for IV antibiotics and anti-inflammatories. It was tricky, because anti-inflammatories suppress the immune system, so it ended up taking almost a week for the swelling to go down. Yay for travel insurance! 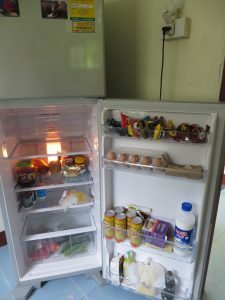 A friend was leaving the island, so we took the opportunity to buy his fridge (a major upgrade from the dirty and broken old fridge that came with the house). He lived in a house that was well back from the road, with a resident water buffalo. We didn’t buy the water buffalo. The fridge was a Hitachi, bought new by Spanda, with a separate freezer (loooxury!). We borrowed a ute from another friend, Govinda, to move the fridge on the day Spanda was leaving. Not that we have too much to complain about, with all the great restaurant food available nearby. 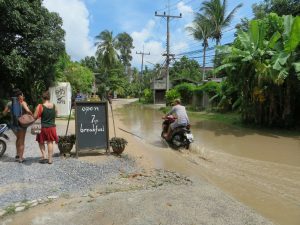 But it’s nice not to have to go out, especially in the wet season. During this time, our neighbours at the school end of our road acquired two piglets. They didn’t acquire a fence. 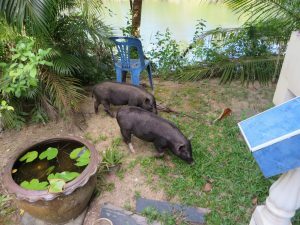 After meeting the piglets on the road a few times, the duo found their way into our yard. They were cute, curious, and mostly harmless, but we weren’t sure what to expect as they grew into the hyper-effective ploughing units that pigs can be. Hero (by now quite accustomed to being called “Bro”) continued to settle and make himself comfortable. He likes having a chin rest. He likes it so much, in fact, that he will put himself in very awkward-looking positions, just to have a place to rest his chin. It can make working a little tricky, sometimes.